Awesome works exceptional no issues. I have a old pair of peerless and this new set is great. Glad to have them. Frankly, I knew what to expect from Peerless handcuffs. No surprise. I was not disappointed. Very Nice Cuffs Amazing smooth operation, beautiful shiny finish, and every other person I know who owns these cuffs said they have an incredible life span Very satisfied with these cuffs. I've been using Peerless for over 20 years. It's definitely a quality item. 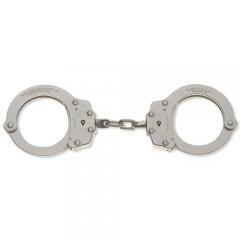 Good solid cuffs. Locking and ratchet mechanisms are very smooth. Work perfect, haven't had any problems. Perfect, in my opinion, these are the only way to go.